One of the challenges to understanding black holes is that when things get close to a black hole, things get complicated. We actually have a good description of black holes by themselves, but the description of the heated material near a black hole is complex. To understand the behavior of this material you need to account for not only the gravitational attraction of the black hole, but also things such as magnetic fields. To model active black holes, you need sophisticated computer simulations, and those simulations rely on certain assumptions about how black holes interact.The assumptions we make about black holes is based upon observations we have of black holes. Some properties, such as rotation, we’ve been able to get good measures of, but other properties such as the strength of magnetic fields near a black hole have been more challenging. Now a new paper in Nature has presented a good measure of magnetic field strength near supermassive black holes, and it is a bit surprising. Comparison of magnetic flux vs accretion disk brightness. Credit: M. Zamaninasab, et al. In the paper the authors looked at 76 active (radio loud) supermassive black holes. First they measured the brightness of the accretion disk of each black hole, then they measured the jets emitted from the black holes, from which they could determine the strength of their magnetic fields. They then compared the brightness of the accretion disks with the strength of the magnetic fields. They found the two were strongly correlated across seven orders of magnitude. What this means is that the magnetic field plays a crucial role in the production of black hole jets across a wide range of black hole masses. 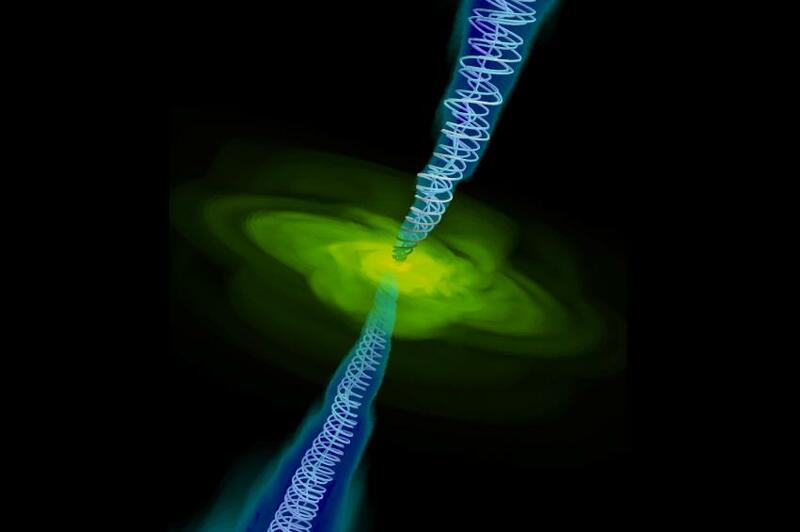 From this correlation they could also determine the strength of the magnetic field near the black hole itself. It turned out to be much stronger than expected. So strong that it can seriously effect the behavior of the black hole accretion disk, such as compressing it magnetically. It can even act to inhibit the infall of material into the black hole. Basically, the magnetic fields near a black hole can be as strong as those in an MRI, and they can affect the surrounding material as strongly as the gravity of the black hole itself. While we’ve known that magnetic fields have a significant effect on black hole dynamics, we hadn’t thought they were strong enough to seriously affect accretion rates. So now we have a better understanding of black hole magnetic fields, and that means modeling these beasts will require a bit more animal magnetism.